I was just studying the gull in Peter’s photo. In my opinion the overall whiteness of the underside, head, back and wings of this bird indicates either an immature Iceland Gull or an immature Glaucous Gull as Pascal thought. An immature Herring Gull would be a lot darker overall while an adult would have a greater contrast between the white underside and a darker mantle and wings unlike the bird in the photo. Where were the dark feathers located on the bird when it took flight? Is it possible they were not on the wing tips but on the mantle, secondaries, or undertail coverts which often have darker coloured feathers in those locations in second year birds of either species? Or could it even be the result of shadowing from the sun because of the change in viewer perspective similar to the darker appearance of the breast and belly of the bird in the photo? Since the bird is not with other gull species like Herring Gulls or Great Black-backed Gulls, there is no way to judge its relative size to them in order to decide between iceland or glaucous. It is therefore necessary to rely on other characteristics. For instance, the wingtips of the iceland extend farther beyond the tail than for the glaucous. However, because of the oblique angle of view with the bird facing the camera, the rear area is not clearly visible making it impossible to determine the relative difference in the distance between the end of the tail and the primary wingtips. The pink legs that are quite noticeable are of no use either since both iceland and glaucous have this leg colour. In this case I believe the best bet for distinguishing between the two species is the bill. My impression from the photo is that the bill is bicoloured with a dark tip which is characteristic of second year birds of either species. However, the bill also appears to be heavy and fairly long considering the distance from the eye to the dark tip, which favours the second year Glaucous Gull. By comparison the Iceland Gull has a relatively small bill. Therefore, I am leaning toward a second year Glaucous Gull. 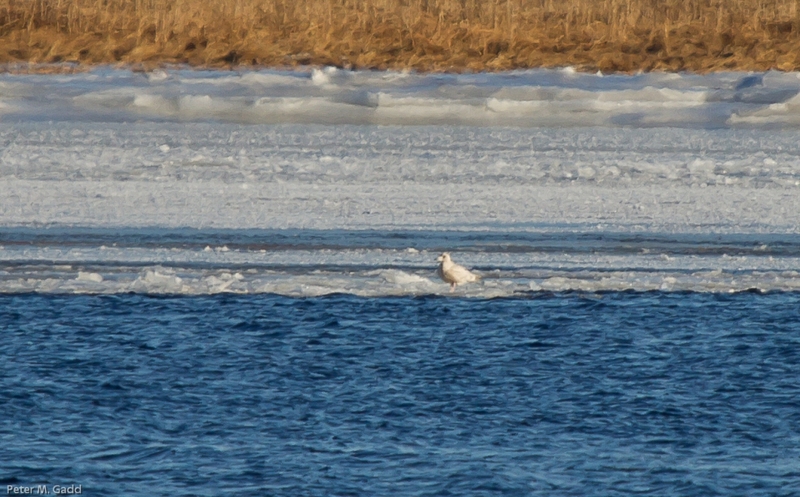 I lean heavily towards the Glaucous Gull because as we were watching it for the brief time it walked on the ice, the slow gate was more that of a larger bird. The black on the bill was only at the very tip and the bill was quite heavy. My comment on the darker feathers as it flew off was not written properly. What I should have said was that when it flew off the plumage looked a little darker overall which could have been due to cloud cover as Dave said or just perceived as darker against the sky. I was looking at the past Christmas Bird Count records for Miramichi. Very interesting to note that the Glaucous Gull is present in 14 of those years with a high number of 25 birds in the 1988 count. The Iceland Gull showed up in 7 of those years with a high number of 4 in 2009. As for the Red-bellied Woodpecker it was present in 1994, 2003 and 2004. This year it will have made the count period only. I haven’t seen it since late Saturday afternoon. « Posted ” in the field” from smart phone!